Broccoli Rabe (pronounced Broccoli Rob) is also referred to as rabe or rapini. This is another leafy green vegetable that is frequently eaten in Southern Italy and has become popular in the United States. The vegetable has a slightly bitter taste and is frequently steamed or lightly sauteed in olive oil. Rapini has many spiked leaves that surround a green bud which looks very similar to a small head of broccoli. There may be small yellow flowers blooming from the buds, which are edible. Food complements: Lemon, Garlic, Olive oil, Parmesan. Substitutes: Chinese broccoli, Swiss chard, Turnip greens, Kale, Dandelion greens. Choosing: Look for broccoli rabe that is bright green with firm, crisp leaves and no yellowing or spotting. Choose a bunch with the thin and firm stalks possible to avoid most of the toughness. Buying: Due to its increasing popularity, broccoli rabe can be found in many conventional grocery stores' produce section. Also try farmers' markets in the early spring during its peak season. It is also common to find broccoli rabe in gourmet markets and Asian markets, especially when not found in standard groceries. 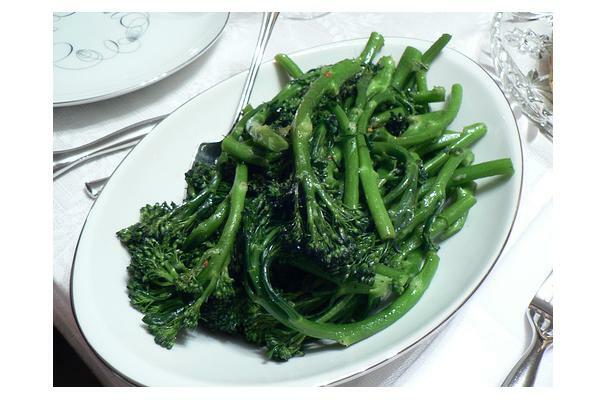 Procuring: Broccoli rabe is grown throughout the world in temperate climates and is a common crop, especially in Italy. Its peak season is in the early spring, when it can be found at its most plentiful. Due to the toughness of the raw vegetable, broccoli rabe is usually steamed or sautéed prior to consumption. Remove an inch of the stems and peel the lower half of especially thick stems to avoid the toughest parts. Broccoli rabe makes an excellent side dish when sautéed with garlic and olive oil, and has enough flavor to compliment heavy, spiced entrées. Cleaning: Rinse thoroughly with cold water. Prior to washing, broccoli rabe can be stored in the refrigerator wrapped loosely in plastic for about three days. After cooking, it may be kept in the refrigerator in a sealed container for up to two days. Freezing broccoli rabe is not recommended. History: Long cultivated in the Mediterranean region, broccoli rabe has traditionally been especially popular in Italian cuisine. It was introduced as a crop to the United States in the 1920s by Italian immigrants and has been slowly growing in popularity with its growing exposure.